Jamie Leavitt of Millinocket and Emily Jose of Caribou claimed top honors in the Cary Classic Benefit Golf Tournament, held Saturday, July 7, at Caribou Country Club. 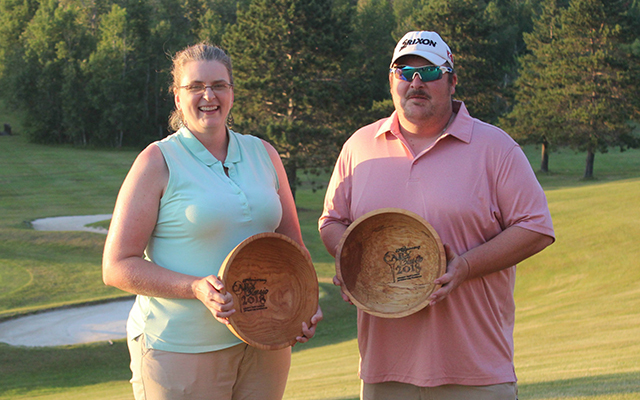 CARIBOU, Maine — Jamie Leavitt of Millinocket and Emily Jose of Caribou claimed top honors in the Cary Classic Benefit Golf Tournament, held Saturday, July 7, at Caribou Country Club. Leavitt shot an 18-hole score of 75 for Division I low gross honors. 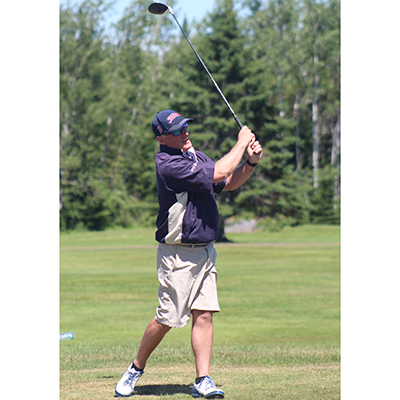 He won by two strokes over Steve Clark of Caribou and Ralph Michaud of Presque Isle to earn the $300 grand prize. Jose defended her title in the ladies’ division by finishing with a gross score of 85, one stroke better than former champion Betty Deveau of Caribou. She also won a $300 cash prize. Leavitt and Jose each received a commemorative wooden bowl engraved with the tournament’s logo. This year’s tournament featured a field of 90 golfers, which was the most in over a decade, according to Tami Kilcollins, executive director of the Jefferson Cary Foundation and the tourney coordinator. The Cary Classic is organized by the foundation and features Katahdin Trust Company as the major sponsor. In addition to Katahdin Trust Company’s major corporate sponsorship, more than 50 other businesses contributed corporate and hole sponsorships and a number of other local businesses and individuals made cash donations or provided prizes. The $35,000 hole-in-one prize on hole No. 7 was not awarded, but Craig Staples of Caribou came the closest as he put his drive approximately six feet from the pin. Men’s Div. I, first gross, Leavitt, 75; second gross, Clark, 77; and third gross, Michaud, 77. First net, Tyler St. Pierre, 71; second net, Erik Anderson, 73; and third net, Steve Gagnon, 73. Men’s Div. II, first gross, Mike Gagnon, 82; second gross, Frank Bemis, 85; and third gross, Chris Richards, 86. First net, Jeff Perley, 70; second net, Hiram Towle, 71; and third net, Branden McLaughlin, 72. Men’s Div. III, first gross, Rick Theriault, 88; second gross, Dale Plourde, 92; and third gross, Dan Cote, 93. First net, Greg Dickinson, 73; second net, Rick Hallowell, 75; and third net, Craig Gustafson, 76. Men’s Div. IV, first gross, Tyler Dombroski, 87; second gross, Andrew Pelletier, 100; and third gross, Neal Griffeth, 100. First net, Peter Doebener, 72; second net, Jon Langley, 75; and third net, Roger Anderson, 76. Women’s Div. I, first gross: Jose, 85; second gross, Deveau, 86; and third gross, Lupita Albert, 89. First net, Vickie Boucher, 68; second net, Darlene Higgins, 74; and third net, Jane Hochholzer, 75. Women’s Div. II, first gross, Judy Dombroski, 91; second gross, Jessie Thompson, 92; and third gross, Jen Flynn, 100. First net, Jane Hunter, 68; second net, Dee Lizotte, 71; and third net, Janice Beaulieu, 72. Plans are already underway to mark the 36th playing of the Cary Classic on July 6, 2019.